When urban planners and developers want to know what businesses local residents would like in their neighborhoods, where to put new bike lanes, or specific areas in need of revitalization, who better to turn to than the citizens themselves? Crowdsourcing urban planning puts the future of cities into the hands of the people in all sorts of unexpected ways, from custom-designing new downtown districts to identifying problem areas for cyclists and pedestrians. SpaceHive is a website that crowdfunds civic projects in England, with proposals ranging from neighborhood festivals to new performance spaces in disused urban areas. It’s similar to Kickstarter, but focusing exclusively on community improvement. 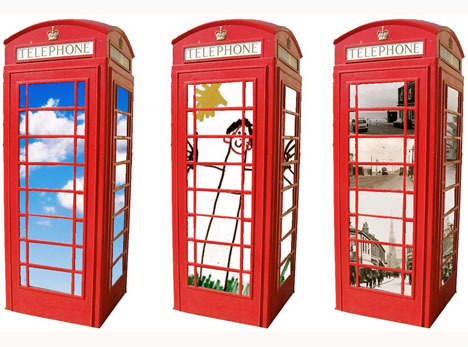 One recent project, the Porty Light Box, renovates decommissioned red phone booths into light boxes that display local artwork and images. Where do cities need new bike lanes? Officials certainly get a clue when citizens take matters into their own hands and create their own guerilla bike lanes, as they have in cities like New York and Baltimore. 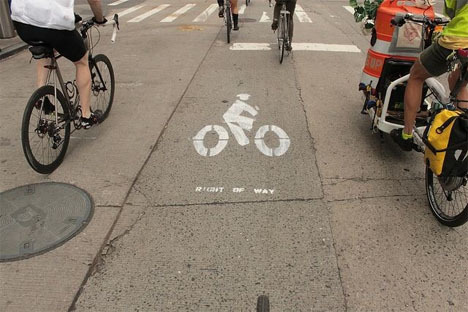 A group of Manhattan cycling activists called Right of Way have taken matters into their own hands, spray-painting lines and bicyclist icons just as the real thing would look (except some of the icons have wings.) In several cities, including Seattle, those DIY efforts have become permanent. 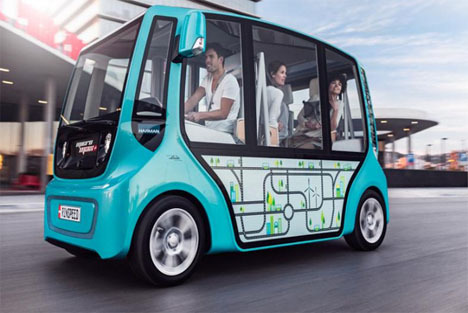 While the Rinspeed microMAX is just a concept, it’s a thoroughly intriguing one: a silent minibus that relies on data points like current traffic conditions, known choke points and other info to generate a straight shot from your pick-up location to your destination. A companion app for microMAX users would enable you to find a bus in your area with a free seat, find out how long it would take to get you to your desired stop, and call for it to pick you up. Being connected to the ‘cloud’ creates an efficient, flexible and convenient transport system without wait times, prior planning or detours. How could the city of Bristol, Connecticut improve and grow to best suit its residents’ needs? 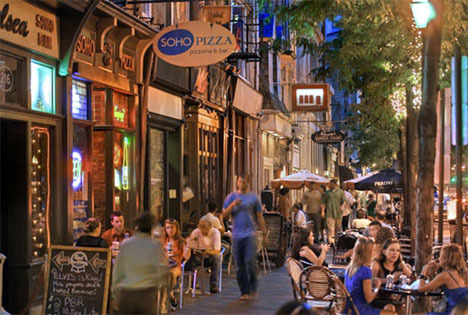 Officials have gone straight to the source with ‘Bristol Rising,‘ an interactive initiative to turn the city’s flagging downtown back into a thriving destination with “a vibrant, walkable, contiguous experience.” Residents are invited to upload their own ideas and join in on discussions at the website so developers can gauge exactly what the community wants. 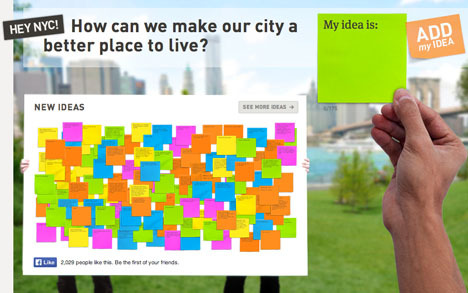 A similar project asks New Yorkers, “How can we make our city a better place to live?” The community is invited to submit ideas at the Change by Us NYC website, where a network of city leaders reads and considers each proposal. Successful 2013 projects include a new community garden and greenhouse. 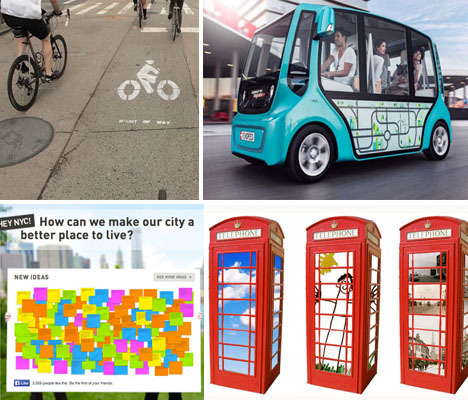 Ideas include cleaning and repairing existing bike lanes, new pedestrian bridges, composting locations and discounted Citi Bike memberships for low-income residents.